This probably isn’t a huge shocker, but two of the top 3 New Year’s resolutions for 2019 were to eat healthier and get more exercise (in an effort to lose weight). While many people made this resolution – probably with lots of good intentions – research shows that only 8 percent will actually be successful and that around 80 percent of those resolutions will fail as soon as the second week of February! Those aren’t numbers you want to write home about and we want to prevent you from becoming one of them. If you’re at the point in the New Year where you’re starting to fall off the New Year’s resolution wagon, we want to help pick you back up. Our success depends widely on YOUR success and, more than anything, we really want you to be successful. That’s why we’re giving you some tips to help you re-evaluate your resolutions so you can reach those goals. “Eat healthier” and “get exercise” may among the most popular resolutions of the year, but they’re just not specific enough. Telling yourself that you’re going to eat healthy or exercise more without providing any real plan sets you up for failure because it’s too broad. Instead of saying “I’m going to eat healthier” say something like “I’m not going to eat potato chips or dessert for the next 6 months”. Giving yourself a tangible, small goals that will lead to your large goal is more effective than just making a general statement. If you said you were going to eat healthier or exercise more, think about HOW you will do that and map out that plan. While we love ambition, getting a little too ambitious with your resolutions can set you up for failure. Telling yourself that you’re going to lose 20 pounds every month for the next 6 months just isn’t realistic – and that can take a toll on you. Sit down and re-assess your resolution. Is it realistic? If not, change it to make it more do-able for you. Remember, that an average person loses 1-2 pounds per week, which translates to 4-8 pounds per month. Base your goals on those numbers. That way, anything more will just be a bonus. The scale is a good way to keep yourself accountable, but it’s easy to stop weighing yourself when you feel like you’re getting off track. Instead of relying on yourself to step on that scale every day, make a visual. We like the idea of two jars and some marbles or decorative glass stones. 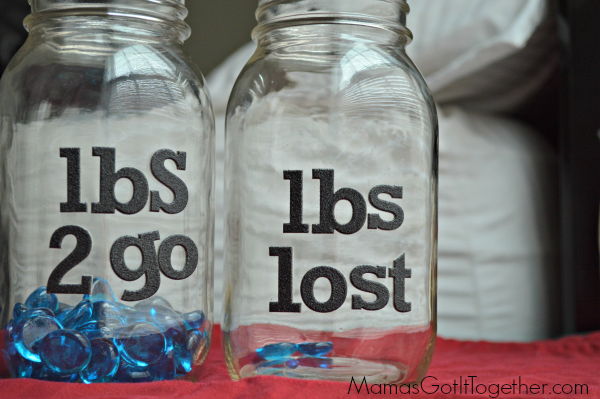 Mark one jar “pounds I have to lose” and another jar “pounds I’ve lost”. As you lose weight, physically move one marble or stone from the pounds I have to lose jar and put it in the pounds I’ve lost jar. If you gain weight back, you have to move the marble/stone back. Having a visual that you can see every day is a great way to keep you on track and accountable. Unfortunately, negative self-talk is the way of the world, but try to avoid falling into that pattern. If you don’t believe in yourself, who will? There’s a quote by Henry Ford that says “whether you think you can or you think you can’t, you’re right”. Your attitude has a LOT of impact on your success, so always believe in yourself, even if you gain a couple pounds back. You CAN lose weight and you CAN keep it off.